Note all the galls along the stem to the right. Many have started at pruning wounds. Crown gall continues to be a major problem for the nursery industry, both in woody and herbaceous plants. 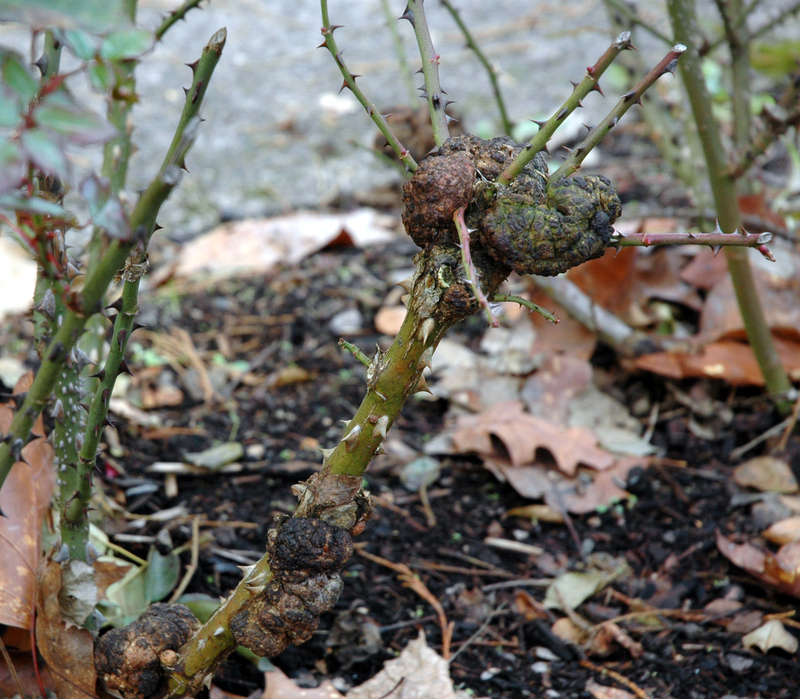 The pathogen causing crown gall in the most plants is Agrobacterium tumefaciens (Rhizobium radiobacter). A. rubi is much less common, and causes disease only in Rubus spp. (although A. tumefaciens does as well), and A. vitis is specific to grapes. A fourth species A. larrymoorei, causes galling of Ficus benjamina. All of these species have a similar biology. This discussion covers the biology, host range, symptoms, and management of the disease. Crown gall is a tumor-forming disease of plants caused by pathogenic species of Agrobacterium. Agrobacterium is a bacterial genus thought to be present in most agricultural soils. The pathogens, in soil or on infested plants, are disseminated by splashing rain, irrigation water, heeling-in galled plants with healthy plants, farm machinery, pruning tools, wind, and plant parts used for propagation. Wounds are required for the pathogen to infect a plant. Wounds are made by pruning and cultivation, emergence of lateral roots, frost injury, and insect and nematode feeding. The pathogen colonizes the wound, attaches firmly to injured plant cells, and transfers part of its DNA into the DNA of the plant. Galls appear in a matter of weeks at temperatures above 70°F. Latent infections typically develop into galls in a later growing season. The gall provides a nutrient-rich environment for further bacterial growth. Pathogenic bacteria escape from the gall into the surrounding soil or water where they colonize or infect new plant tissues. Although commonly reported to have a host range of hundreds, this information is based on artificial inoculations, and on a practical basis, far fewer plants are naturally susceptible. (Examples of host plants infected by Agrobacterium are listed in Table 3.) However, the root systems of non-host plants such as weeds, grasses, and cereals can harbor the pathogen and serve as a reservoir of inoculum in natural settings. The disease is called crown gall, but galling may be found at the base of cuttings, on roots, crowns, or on stems, canes, vines, or leaves. Leaf galls are usually found on herbaceous plants that have a systemic infection. (Herbaceous ornamental plants susceptible to crown gall are shown in Table 1.) Galls can be on pruning wounds. Galls are usually rounded and are often textured like a cauliflower head. On woody perennial plants, galls become more woody and fissured with age, sometimes reaching a diameter of 4 inches, and girdling the stem. Galls on grapevines, blueberry, and bramble fruit are usually elongate, erumpent ridges of tissue bursting through the outer stem tissues. Woody plants infected the first year they are planted out are more severely damaged. (Woody plants susceptible to crown gall are shown in Table 2.) Severely galled young plants are weakened, stunted, and unproductive and occasionally die due to an inferior root system. Literature reports of crown gall damage are contradictory; they range from benign to debilitating to deadly. Symptoms become evident 2 to 4 weeks after infection if temperatures are at or above 68°F, usually coinciding with warmer soil temperatures in May or June. Initially, the galls look like callus outgrowths but then increase rapidly in size and number. Symptom development slows greatly below 58°F and stops below 50°F. Infection is inhibited above 92°F to 95°F. Latent infections are symptomless and usually occur when soils are cool. Gall symptoms typically develop at the infected wound the following season; on rare occasions galls don’t appear until the third growing season. Some problems can look like crown gall but are not pathogenic. Aerial burrknot on apple tree trunks and branches is a cushion-like assemblage of adventitious roots; its cause is thought to be genetic rather than an infectious agent. Tissue proliferation is another tumor-like problem, on Rhododendron, that is caused by factors other than Agrobacterium. Vascular tissue differentiation in tissue proliferation distinguishes it from wound callus and crown gall. Small galls require careful diagnosis because they may be confused with excessive wound callus. Detection using molecular methods specific to plasmid gene regions involved with virulence, or isolation of bacteria later identified as pathogenic is necessary to confirm a crown gall diagnosis. Nonpathogenic Agrobacterium cells are often prevalent in these same tissues and can reach high populations. That makes diagnosis difficult, especially in galls on apple, blueberry, and grapevines where non-pathogens can constitute over 99% of the Agrobacterium population. Pathogen-free plants grown in uninfested soil will not develop crown gall. This emphasizes the importance of planting clean propagating material in clean soil. Good sanitation and cultural practices are important deterrents to crown gall. Discard all nursery stock showing symptoms to avoid contaminating healthy plants and storage facilities. At harvest, leave noticeably galled plants in the field for later pickup and destruction. If possible, choose a rootstock that is less susceptible, avoid planting sites heavily infested by root-attacking insects and nematodes, disinfect pruning equipment between trees, and adopt management practices that minimize wounding. Avoid planting into heavy, wet soil. Don’t plant trees deeper than they grew in the nursery. If possible, incubate dormant seedling roots at 73°F to 76°F for 10 to 14 days to heal wounds and reduce susceptibility to A. tumefaciens before planting them in wet soil. Use irrigation water from wells, if possible. Avoid planting where galled plants grew in the last 4 to 5 years; choose fields that were planted recently to vegetables or grain. In summary, think prevention—avoid exposing plants to pathogenic Agrobacterium at any stage of plant production. Crown gall is generally much more prevalent in heavy soils or in soil where water stands for a day or so. In New York, crown gall incidence was highest on a heavy clay knoll (15 ft elevation) from which water drained toward flat, loamy portions of the field. In Oregon, gall incidence on an Old Home x Farmingdale pear rootstock selection was severe (495 of 500 trees infected) in a heavy, wet soil, but in the same field only 1 of 500 trees was galled outside the wet area. Cropping history can influence crown gall incidence. Budded apple trees became badly galled in fields where a previous nursery crop such as grape, peach, raspberry, and rose had been heavily infected. This situation isn’t repeated at every site, but we still recommend avoiding fields with a recent history of crown gall. Reports of resistance in plants normally susceptible to crown gall are limited and depend on the strains of bacteria present in a given location. There are no reliable lists of cultivars with resistance that hold up in all geographic locations. It is better to select plants that are not susceptible in the first place if crown gall is a chronic problem in a particular field. Using A. radiobacter K84, a biological control agent, has been very effective against crown gall on a number of hosts, but exceptions exist. This biological control is solely preventive, not curative; application timing is critical to properly protect plant wounds caused at harvest or by pruning. Htay and Kerr recommend seed and root treatment with K84 for best results. Not all pathogenic strains of Agrobacterium are sensitive to K84. For example, most pathogenic agrobacteria isolated from grape tumors are A. vitis, which are insensitive to K84. If K84 has been used properly and galling persists, its use should be discontinued since it is likely the bacteria present are not sensitive to the product. A new, genetically engineered strain of K84 called K1026 had been patented in the United States. Biological control is compatible with a few pesticides such as metalaxy (Ridomil), thiram and thiophanate-methyl (Topsin) but not with captan, etridiazole alone (Truban), etridiazole plus thiophanate-methyl (Banrot or Zyban), mancozeb, PCNB or streptomycin. It is also not compatible with chlorinated water. No registered chemicals that effectively control crown gall are currently available in the United States. In general, chemical preplant dips or soil drenches have been ineffective. Fumigation to rid soil of Agrobacterium generally has been ineffective, and in some cases growers reported more disease after fumigation. Heat therapy has been tried in cherry and plum seedlings, and in dormant grape cuttings. Although these measures can reduce the incidence of disease, there will still be a small percentage of plants that remain infected. Time and temperatures needed for effective heat therapy has not been determined for many plants, and injury to the plant material can occur when temperatures are too high. Although promising, heat therapy is not commonly used due to these difficulties. In solarization, a thin plastic film is stretched over moist soil to capture energy from the sun and heat the soil to temperatures that kill pathogenic microbes. A. tumefaciens populations could not be detected in a solarized sandy loam soil, but solarization did not work in the heavier silty-loam. Mazzard cherry seedlings planted later in solarized and in nonsolarized control plots developed crown gall only in the nonsolarized plots. Following is a summary of the best practices for managing crown gall. They include experimental results and grower observations. Understandably, physical and economic constraints occasionally may impede applying all these practices. But for best results, follow or adapt the procedures as closely as possible to fit your management plan. Discard diseased plants as soon as noticed to avoid cross-contaminating other plants, equipment, or storage facilities. Don’t heel-in galled plants with healthy plants. Use good sanitation in handling planting stock. Minimize wounding; disinfect pruning tools between plants. Avoid fields with a recent history of high crown gall infestation. Select well-drained soils; tile heavy soils. Field-fallowing is helpful but may be impractical west of the Cascade Range. Rotate susceptible crops with small grains. Plant when soil is below 50°F. Avoid mechanical injury from tillage, hoeing. Irrigate with deep-well water or sanitized pond water. Keep grafts and buds above soil line. Avoid high nitrogen and irrigation late in the growing season. The following are specific procedures for commonly grown plants that can be used in addition to the above general procedures. Stone Fruit, Nut Crops, Roses: Dip or spray with the biocontrol agent K84. Apply to seed, bare roots, and aboveground grafts. Anderson, A.R., and Moore, L.W. 1979. Host specificity in the genus Agrobacterium. Phytopathology 69:320-323. Aubert, B., Faivre Amiot, A., and Luisetti, J. 1982. Phytosanitary selection work in Reunion on some fruit trees with a low chilling requirement. Fruits 37:87-96. Bazzi, C. 1983. Biological control of crown gall in Italy. In: Proceedings of the International Workshop on Crown Gall, Wadensville, Switzerland, R. Grimm (ed.) Wadensville, Switzerland: Swiss Federal Research Station for Fruit-growing, Viticulture, and Horticulture. Bradbury, J.F. 1986. Guide to Plant Pathogenic Bacteria. Slough, United Kingdom: C.A.B International Press. Canfield, M.L., and Moore, L.W. 1992. Control of crown gall in apple (Malus) rootstocks using Copac E and Terramycin. Phytopathology 82:1153 (Abst.). Canfield, M.L., Putnam, M.L.,White, T.J., and Moore, L. W. 1995. Isolation of Agrobacterium tumefaciens from blueberry (Vaccinium corymbosum). Phytopathology 85:1194 (abst.). Cazelles, O., and Epard, S. et al. 1991. The effect of disinfection with oxyquinoline sulfate of the Berl. x Rip. 5C rootstock on the expression of crown gall in grape propagation. Revue Suisse de Viticulture, d’Arboriculture et d’Horticulture 23:285-288. Deep, I.W., and McNeilan, R.A. et al. 1968. Soil fumigants tested for control of crown gall. Plant Disease Reporter 52:102-105. Dhanvantari, B.N., and Johnson, P.W. et al. 1975. The role of nematodes (Pratylenchus penetrans, Meloidogyne hapla, Meloidogyne incognita) in crown gall infection (Agrobacterium tumefaciens) of peach in southwestern Ontario. Plant Disease Reporter 59:109-112. Durgapal, J.C. 1977. Evaluation of rootstocks of pome and stone fruits and related wild species for resistance to crown gall. Current Science 46:389-390. Garrett, C.M.E. 1987. The effect of crown gall on growth of cherry trees. Plant Pathology 36:339-345. Gloyer, W.O. 1934. Crown gall and hairy root of apples in nursery and orchard. Geneva, NY: New York Agricultural Experiment Station Bulletin 638. Goodman, R.N., and Grimm, R. et al. 1993. The influence of grape rootstocks on the crown gall infection process and on tumor development. American Journal of Enology and Viticulture 44:22-26. Grimm, R. 1987. Control of crown gall in Swiss apple nurseries. Bulletin OEPP/EPPO Bulletin 17(2):269-272. Heimann, M., and Beicht, W. 1980. Crown gall on (Erica) gracilis: what is it really? Gb + Gw, Gñrtnerbîrse und Gartenwelt. 80(32):712-716. Htay, K., and Kerr, A. 1974. Biological control of crown gall: seed and root inoculation. Journal of Applied Bacteriology 37:525-530. Ishizawa, Y., and Kyotani, H. et al. 1992. Methods for evaluating the degree of crown gall resistance and the varietal differences in peach. Bulletin of the Fruit Tree Research Station 23:37-46. Jaburek, V., and Holub, J. 1987. Effect of the rootstock BD-SU-1 on the growth and productivity of selected peach cultivars. Fruit Growing 60:192-195. Lemoine, J., and Michelesi, J.C. 1993. Agronomic behaviour of pears: incidence of crown gall. Arboriculture Fruitiere 465:23-27. Lu, S., and Canfield, M. et al. 1993. Use of sensitive nonradioactive methods to detect Agrobacterium tumefaciens in crown gall tumors of naturally infected woody plants. 6th International Congress on Plant Pathology, Montreal, Canada. Ottawa, Canada: National Research Council. Mirow, H. 1985. Experiments on the control of crown gall on woody plants in the nursery. Deutsche Baumschule 37:300-301. Moore, L.W. 1976. Latent infections and seasonal variability of crown gall development in seedlings of three Prunus species. Phytopathology 66:1097-1101. Moore, L.W. 1976. Research findings of crown gall and its control. American Nurseryman 144:8-9. Moore, L.W. 1980. Controlling crown gall with biological antagonists. American Nurseryman 151:44. Moore, L.W., and Cooksey, D.C. 1981. Biology of Agrobacterium tumefaciens: plant interactions. p. 15-46 in The Biology of Rhizobiaceae, International Review of Cytology Supplement 13, K. Giles (ed.). New York: Academic Press. Moore, L.W., and Allen, J. 1986. Controlled heating of root-pruned dormant Prunus seedlings before transplanting to prevent crown gall. Plant Disease 70:532-536. Moore, L.W., and Kado, C.I. et al. 1988. Agrobacterium. p. 16-36 in Laboratory Guide for Identification of Plant Pathogenic Bacteria, 2nd ed., N.W. Schaad (ed.). St Paul, MN: American Phytopathological Society Press. Nesme, X., and Beneddra, T. et al. 1990. Importance of crown gall in hybrids of Populus tremula L. x P. alba L. in forest tree nursery. Agronomie 10:581-588. Pierronnet, A., and Eyquard, J.P. 1993. Prunus rootstocks and crown gall. Arboriculture Fruitiere 466:37-41. Pinkerton, J.N., and Canfield, M.L. et al. 1996. Effect of soil solarization and cover crops on populations of selected soilborne plant pathogens. Phytopathology 86 (supplement):S98 (abst.). Pu, X.A., and Goodman, R.N. 1993. Effects of fumigation and biological control on infection of indexed crown-gall-free grape plants. American Journal of Enology and Viticulture 44:241-248. Raio, A., and Zoina, A. et al. 1997. The effect of solar heating of soil on natural and inoculated agrobacteria. Plant Pathology 46:320-328. Rautenberg, E. 1973. Studies on Exobasidium galls of Rhododendron simsii Planch. II: conditions of gall development and the interaction between host plant and cecidia. Phytopathologische Zeitschrift 78(2):121-133. Rebandel, Z. 1979. Effect of crown gall, Agrobacterium tume-faciens, and apple mosaic on bud take and tree growth in the nursery. Roczniki Akademii Rolniczej 114:137-145. Ross, N., and Schroth, M.N. et al. 1970. Reducing losses from crown gall disease. California Agricultural Experiment Station Bulletin 845. Berkeley, CA. Ryder, M.H., and Jones, D.A. 1991. Biological control of crown gall using Agrobacterium strains K84 and K1026. Australian Journal of Plant Physiology 18:571-579. Siegler, E.A., and Piper, R.B. 1929. Aerial crown gall of the apple. Journal of Agricultural Research 39:249-262. Schroth, M.N., and McCain, A.H. et al. 1988. Reduction in yield and vigor of grapevine caused by crown gall disease. Plant Disease 72:241-246. Tawfik, A.E., and Riad, F.W. et al. 1983. Field spread of crown gall and root-knot nematode infection to peach rootstocks in Wady-el-Mollake, Ismaelia. Agricultural Research Review 61(2):193-201. Toumey, J.W. 1894. Preliminary report of observations on the “crown-knot”. Arizona Agricultural Experiment Station Bulletin 33. Tucson, AZ. Utkhede, R.S., and Smith, E.M. 1990. Effect of fumigants and Agrobacterium radiobacter strain 84 in controlling crown gall of apple seedlings. Journal of Phytopathology 128:265-270. Vicedo, B., and Penalver, R. et al. 1993. Biological control of Agrobacterium tumefaciens, colonization, and pAgK84 transfer with Agrobacterium radiobacter K84 and the Tra-mutant strain K1026. Applied Environmental Microbiology 59:309-315. Vogelsanger, J., and Grimm, R. 1983. Collecting bacterial strains from crown galls of apple rootstocks and identification of Agrobacterium tumefaciens. In: Proceedings of the International Workshop on Crown Gall, Wadensville, Switzerland, R. Grimm (ed.). Wadensville, Switzerland: Swiss Federal Research Station for Fruit-growing, Viticulture, and Horticulture. Vrain, T.C., and Copeman, R.J. 1987. Interactions between Agrobacterium tumefaciens and Pratylenchus penetrans in the roots of two red raspberry cultivars. Canadian Journal of Plant Pathology 9:236-240. Note: this is not a complete list, but represents the most commonly infected species. Table 2. Woody plants susceptible to crown gall. Note: this is not a complete list, but represents commonly infected species.